Shop for authentic Missouri Flags. 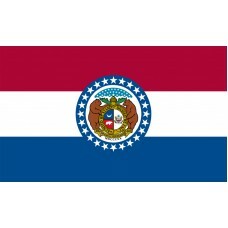 We offer indoor and outdoor Missouri flags in durable nylon. Our outdoor flags are finished with a canvas heading, while indoor flags are finished with a lined pole hem and your choice of with or without fringe. 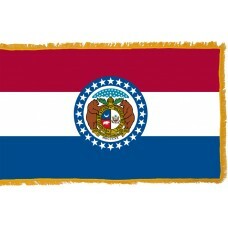 We also offer indoor and outdoor Missouri flag sets. The Missouri State Flag features three horizontal bands in the colors of red, white, and blue. In the center of the flag is the Missouri State Seal. The Missouri Seal features two grizzly bears that represent courage and strength, standing on a scroll that bears the state motto "Salus Populi Suprema Lex Esto" which translates as "Let the welfare of the people be the supreme law." The bears are holding a shield with the motto "United we stand, divided we fall." The right-hand side of the shield illustrates the United States of America's coat of arms which is a bald eagle that is holding arrows and olive branches and on the left-hand side of the shield, there is a grizzly bear and crescent moon. The moon is very symbolic and represents Missouri at the time the seal was being created which was "a state of small population and wealth which would increase like the new or crescent moon." The moon also represents the "second son" as Missouri was the second state that was formed out of Louisiana. Above the shield is a helmet which represents sovereignty and above the helmet is one large star that is surrounded by 23 smaller stars with a cloud around them to represent the problems that Missouri faced trying to become a state. The seal is circled by a band that contains 24 stars which represent Missouri becoming the 24th state of the United States of America. The blue color on the flag represents "the permanency, vigilance, and justice of the state," and the red and white colors represent valor and purity. The Missouri State Flag was designed by Mary Elizabeth Oliver who was part of the Daughters of the American Revolution and was adopted on 22nd March, 1913. Missouri is a state located in the Midwestern region of the United States of America. It shares borders with Tennessee, Iowa, Illinois, Kentucky, Arkansas, Oklahoma, Kansas, and Nebraska. The capital city is called Jefferson City and the largest city is called Kansas City. Missouri is referred to as "The show-me-state" and it is thought it obtained this name from Missouri's Congressman Willard Duncan Vandiver's speech in which he stated, "I come from a state that raises corn and cotton and cockleburs and Democrats, and frothy eloquence neither convinces nor satisfies me. I am from Missouri. You have got to show me." Missouri has been inhabited for thousands of years. Before the Europeans reached the area, Missouri was inhabited by Native American tribes which included the Osage, Missouri, and Illini. French explorers Jacques Marquette and Louis Jolliet reached the area in 1673. In 1682, French explorer Robert de La Salle arrived in the area and claimed the land for France as part of Louisiana. Over the years, small settlements were built including Fort Orleans in 1724 and in 1764, the city of St. Louis was established. In 1762, the Spanish gained control of the area until France regained control in 1800. In 1803, following the Louisiana Purchase, Missouri became part of the Louisiana territory until the Missouri Territory was established in 1812. Missouri became the 24th official state of the United States of America on August 10th, 1821.